After my initial article about my first week at the International Wilderness Guide school, some more time has passed and as there was quite some interest in the first article I will follow up on what happened since. The Trapper tent sans oven I slept in for three nights. Week two was the forest week. We packed our gear Monday morning and were off to the school forest, an over 1000 ha playground, where we pitched our shelters and got comfy. We learned to make fire, chop wood in a safe way, did orienteering with map and compass, went fishing, learned about ultra heavy gear and the flora & fauna around us. It was a busy but fun week. I took my Hennessy Hyperlight hammock along and pitched it the first day, but due to a good breeze and me not having the SuperShelter insulation or an under quilt with me, I retired to the Loue shelter (imagine a tipi kind of shelter, but cut in half) I helped pitch during the day. 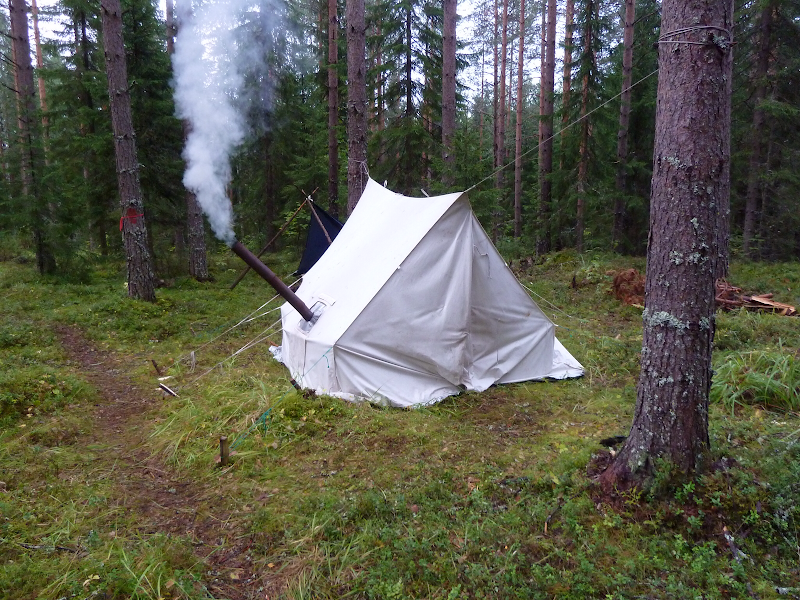 The rest of the nights I went to sleep in a Trapper tent, including a tent oven - which was awesome. Now I am seriously looking at titanium ovens for winter camping, and a suitable tent. For orienteering the teacher said my tiny Suunto compass was not enough and that we need a baseplate compass. Fact of the matter was, that on the second group orienteering exercise and the solo exercise I didn't even touch my compass, orienteering by the features of the landscape, the map and some common sense. I believe that a compass, while useful, should be used only if you're lost or can't use common sense or the landscape to navigate. 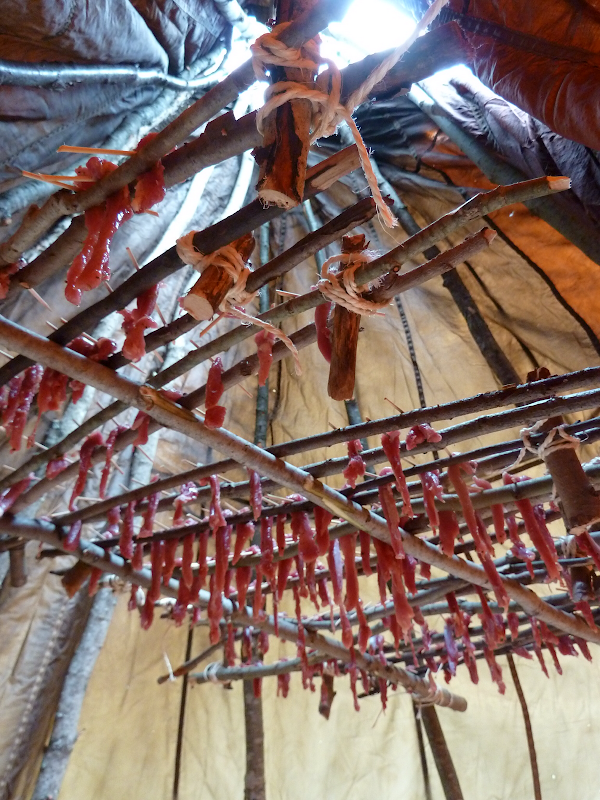 Lamb jerky, dried over the fire. Week three was great fun. Monday morning started with skinning and butchering two lambs, and then preparing them in different ways - fried heart, kidneys and liver, lamb stew, lamb jerky, lamb on a spit - you name it. Delicious as well. 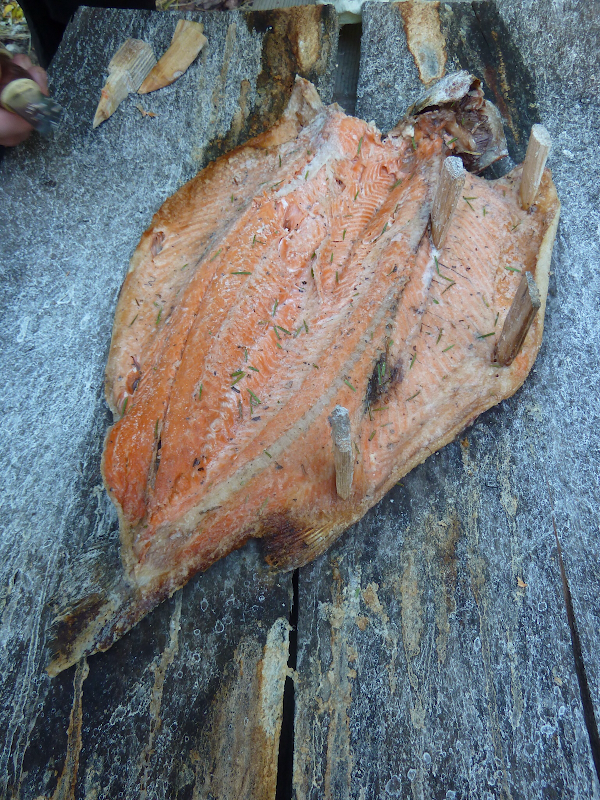 We also made fish, bread from pine bark and normal breads, cheese, and sphagnum moss eggs. Our teacher was truly awesome, a well of knowledge & wisdom with a great sense of humour. 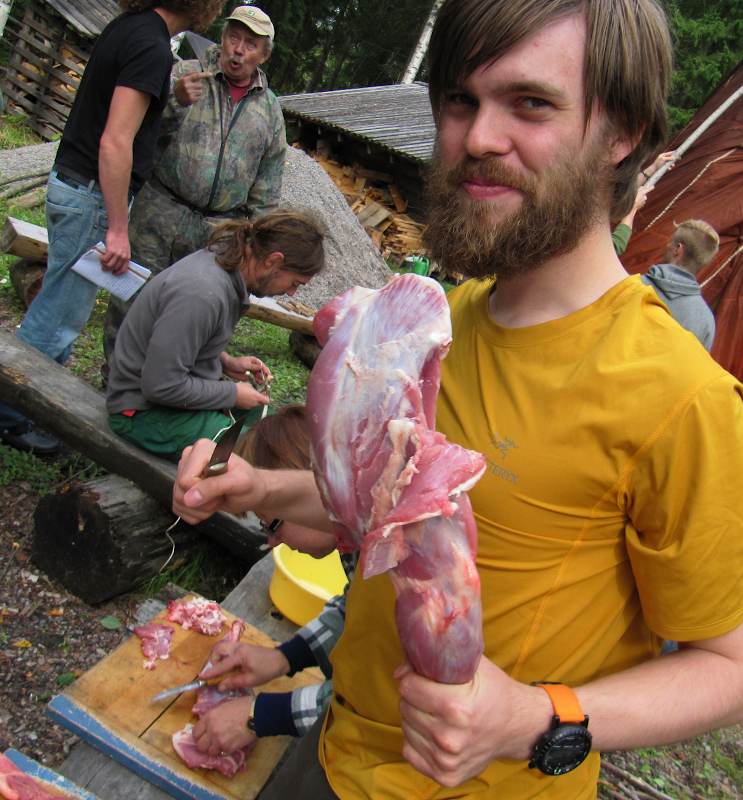 Happy vegetarian - who eats meat he butchered himself! Photo courtesy of Ed Russell. Week four was the BCU canoe & kayak week. After our spring canoe expedition we will get our BCU two (or three) stars awards, this was the introduction week. If you're into paddling, this week alone will make IWG worth your while. Our BCU teacher showing us the tricks of the trade. Our teacher was a former student of the course, class of '98 if I remember correctly. Really good teacher who knows his trade with the eyes closed, and also a great personality. Regarding paddling, canoeing is great if you have a good partner, if your partner ain't the same level then I rather paddle alone in a kayak, which is sweet as you can go significantly faster and are independent. 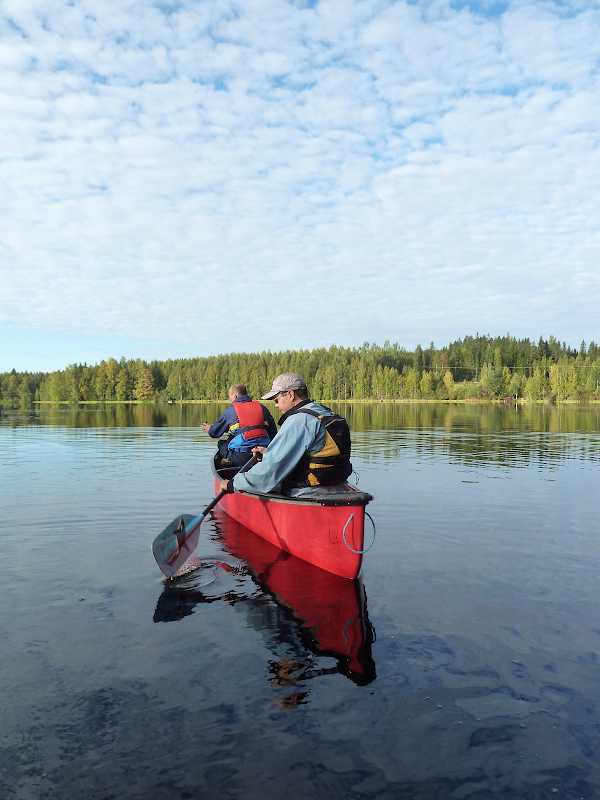 That said, a good canoe, a good partner and I choose the canoe over the kayak. I also had my packraft out on the lake, and both my teachers tried them out; they found it interesting but very different from canoe & kayak, but could see the use. The BCU instructor asked me to take it along on the spring expedition, so it will be interesting to paddle next to the others in my Alpaca. All the time we are now preparing for our trip to Russia next week Monday. It starts to frustrate me slightly that lightweight and UL gear is still looked at with a raised brow, as I am being used to backpack and communicate with like-minded folks; this is quite a change. Shoes, rubber boots to be precise, and my unwillingness to buy and use a pair, seem to be the biggest concern of some classmates and teachers. And being surrounded by the UH folks all the time makes me question some stuff, like if it really is a good idea to walk with my VFFs or Inov-8s through bogs. But then I remember that I did walk with trailrunners through bogs in Sweden, and am confident again that I will be fine - as I said previously, wet feet should be expected and cherished instead of feared (because fear leads to the dark side; fear leads to rubber boots; rubber boots lead to suffering). Weeks five and six then next week, when we will depart for our two week expedition to Russia. I imagine that there might be quite some interest in my gear for that trip, and as it will be quite a mix of UL and traditional gear (we need to carry an axe and saw) I think it will be interesting to post it and see what my dear readers think about it!